Trying to decide between Amazon Echo and Google Home. Any thoughts? This question was answered on June 21, 2017. Much of the information contained herein may have changed since posting. The ‘smart home assistant’ market continues to grow and improve but there’s so much more to this battle than what meets the eye. ‘Smart speakers’ allow you to interact with them through verbal commands and connect to a variety of devices and online services to act as a virtual butler in your home. All of these devices are actually a proxy to the real battle: the platform wars. With the ‘connected home’ market expected to grow to over $50 billion by 2022, finding ways to get consumers familiar with one platform over another can lead to a bigger piece of the market. Amazon was first to market with the Echo, but being first doesn’t always ensure that you’ll end up being the market leader and the gap between Amazon and the rest of field is narrowing. Google’s entry into the market was with a smaller device that they call Google Home. As expected, Google Home is designed to integrate with many of Google’s services like search, YouTube and the Chromecast but also popular services like HBO Now and Hulu. The Echo has substantially more ‘skills’ (https://goo.gl/t953vP) than Google Home, so you can ask it to do more things. Amazon has over 10,000 skills while Google only offers a couple of hundred. This may sound like a huge deal, but it’s likely that the most useful skills like ordering a car or a pizza and getting your favorite playlist to start playing are available on both. 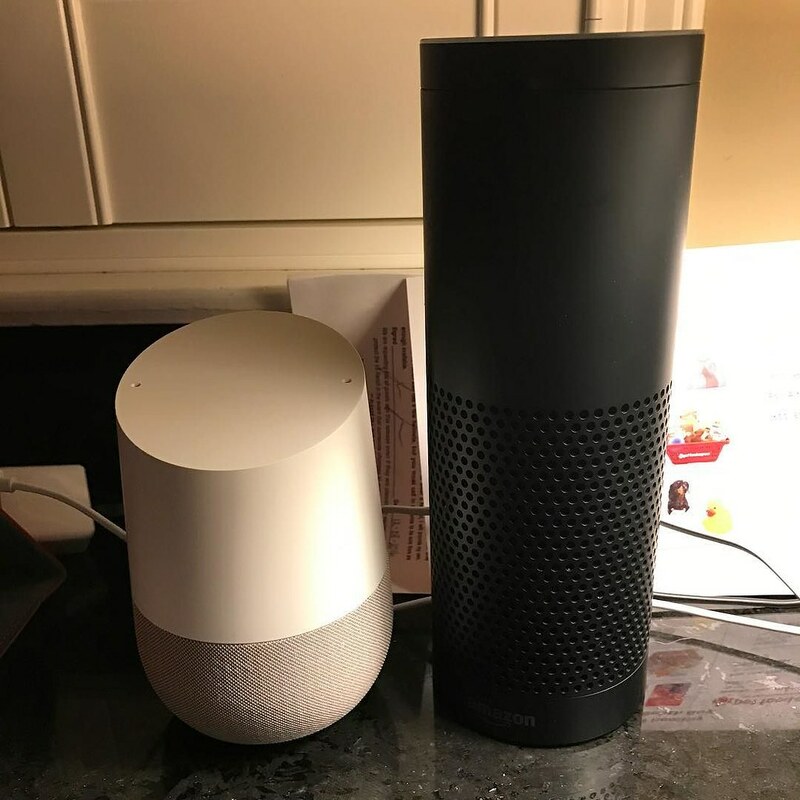 Google’s responses to information found on the web is generally more robust, but as you would expect, the Echo excels when it comes shopping related questions. If you plan on using the device as a music speaker, Home has a fuller sound and it’s smaller, so it’ll fit in smaller bookshelves and nooks. What was once a no-brainer choice (Echo) has now become a little more complicated as each platform has added features and capabilities. The best way to determine which is best for you is to review the supported services and devices for each. Start with your preferred streaming service as well as your music and video streaming services. Amazon made a big splash at this year’s CES with announcements that they were integrating with a lot of other companies including Ford, which is going to allow Alexa to work in the car or check on your car while you’re in your home. Apple users will be able to add a third option in December when Apple will reportedly release the HomePod powered by Siri. As usual, Apple’s option will be the most expensive ($349) vs Amazon Echo ($179) or Google Home ($129) and we really won’t know what it will actually do until it’s released. If you’d like to dip your toe in the smart home assistant pool but you’re not ready to spend the big bucks, I’d highly recommend getting the Amazon Echo Dot ($49) as a primer.